When your garden is producing cucumbers faster than you can eat them, this recipe is just the ticket! It was given to me several years ago by a very good friend who is lovely about sharing her recipes. It is a particular favorite at our church suppers and everyone seems to want to know how to make them. This is the kind of recipe where it’s hard to stop eating them after one serving. You will want to have a 2nd or even 3rd helping—-they’re that good! 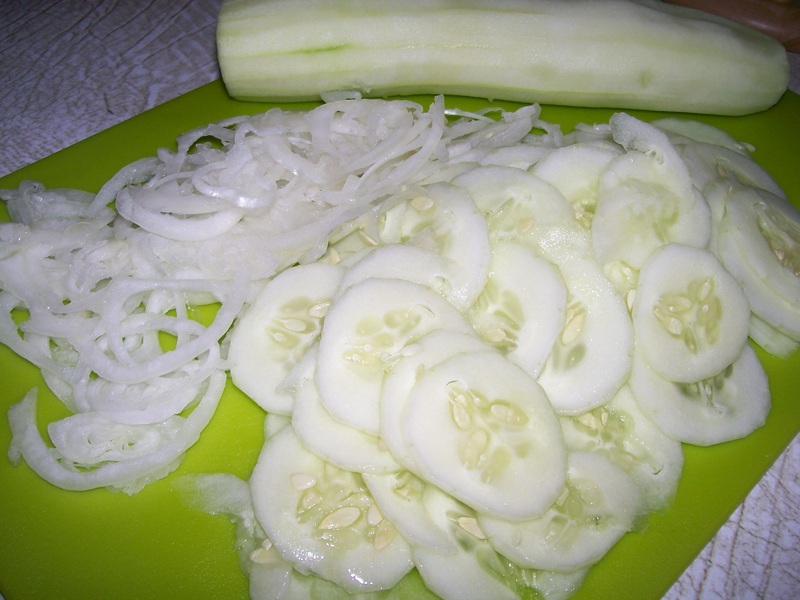 To slice the cucumbers and onion, use a mandolin slicer or the slicing blade on a food processor. You want nice thin uniformly sliced vegetables. 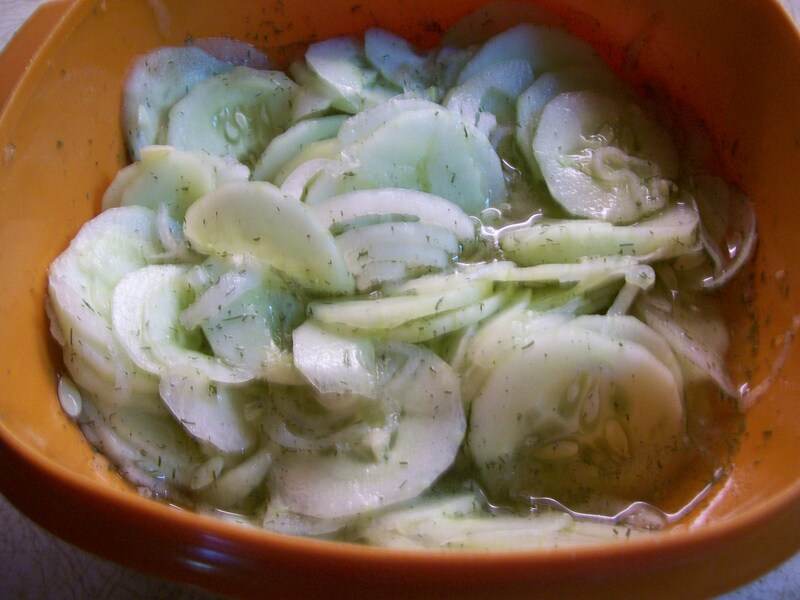 Combine the cucumbers, onions, and dill in a large bowl. 2. In a saucepan, combine sugar, vinegar, water, and salt; bring to a boil. Pour the hot liquid over the cucumber mixture. Stir to expose all the cucumbers and onions to the hot liquid. Cover and chill for at least 3 hours, or overnight. 3. Store in covered containers or jars with tightly closed lids. It is amazing to me how crisp these cucumbers become as they cool. They are great used as a condiment, a cold salad, or layered in a sandwich. (My husband likes them on a grilled hot dog.) They will keep for a week or two in the refrigerator. 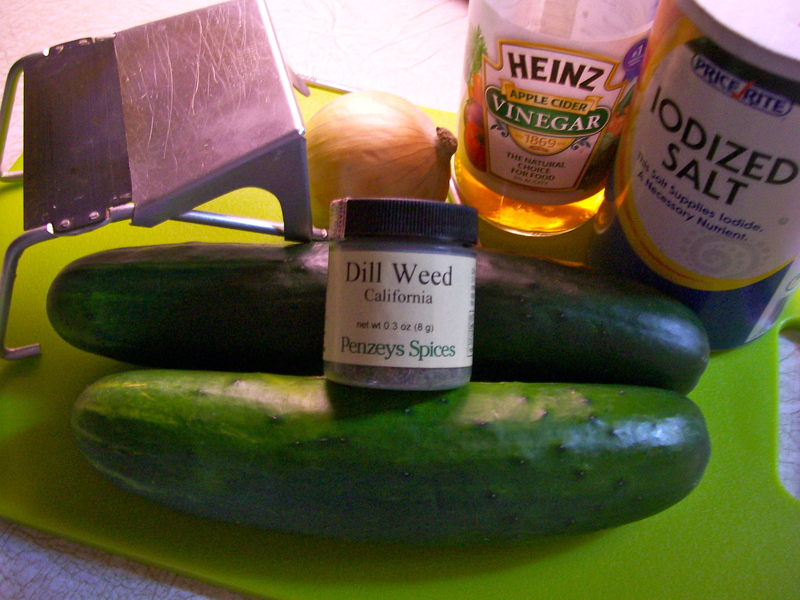 Please note that in the accompanying photos I am making half a recipe with 2 large cucumbers.